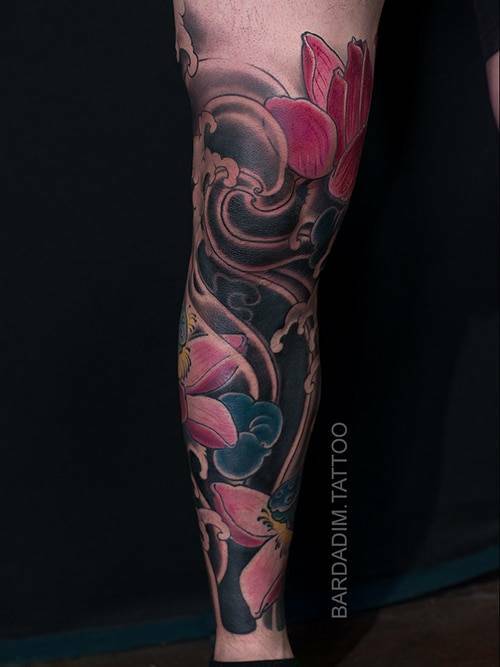 Leg Sleeve Tattoo - JAPANESE TATTOO - Brooklyn, NY. 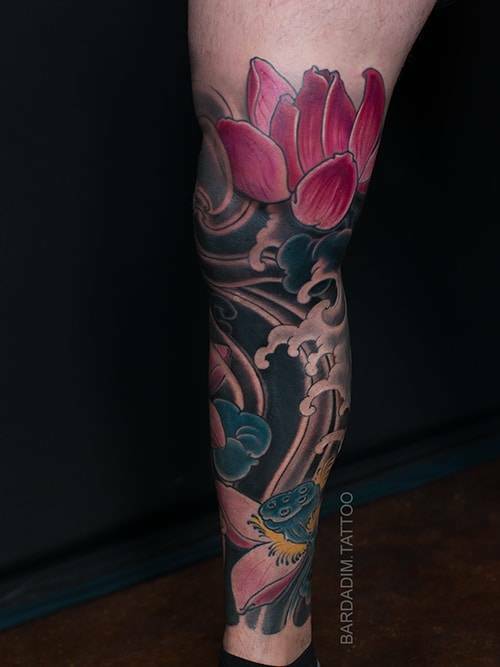 Leg Sleeve Tattoo – Japanese Style Tattoo covering 3/4 of a leg, showcasing Lotuses and Waves. 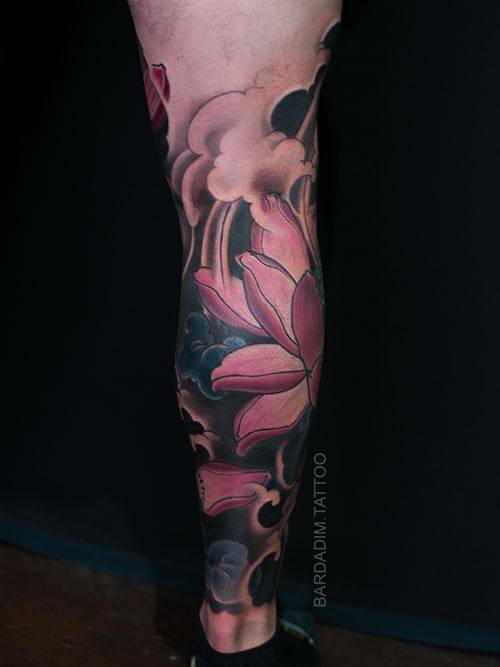 This Leg Sleeve took 5 sessions to finish. Tattooing has decorative and spiritual purposes, so besides highlighting the natural flow of a body we have to keep in mind the meaning of the elements we choose to include to the design. Lotus flower has very powerful meaning in Japanese (and actually worldwide) culture. First of all Lotus is Buddhism symbol. Lotus is bigger than life – it has an ability to rise from a dirt. This process symbolizes attaining enlightenment. It represents purity of the body, speech, and mind. Also you can check out our Q&A section, where we tried to answer all the typical questions. 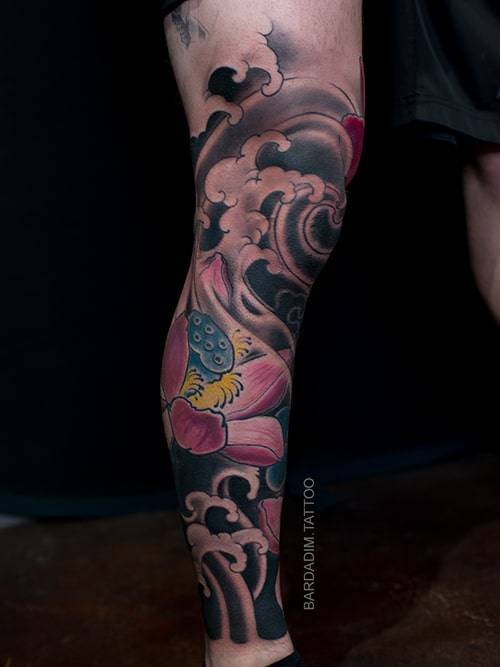 Bardadim Tattoo Studio – Japanese Tattooing, Brooklyn, NY.